iOSnoops is constantly on the lookout for new apps, and here are 37 iPhone and iPad apps that were released recently. 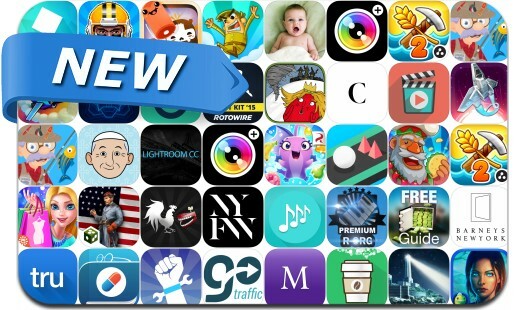 This new apps alert includes Pop the Lock, Devastator, Wonky Ship, Mucho Taco, Civil War: Stonewall, Witches' Legacy: The Ties That Bind, Movie Maker, Nibblers, Slow Down, Touchdown Hero: New Season, Puzzle Craft 2, Shopping Jam and many others. Tap in sequence to crack the code and pop the lock, but don't make a mistake or you'll have to start from the beginning. How many locks can you pop. How far will you go? Mucho Taco is an idle clicker game where you make zillions of tacos with the power of the sun tortilla and the guidance of Barbacoatl, an enigmatic taco connoisseur. With his help, you will build and manage tasty taco restaurants, create delicious salsas and throw hot and vibrant fiestas!. If you’re in the mood for tacos, play Mucho Taco today!